veganmofo 15: Sabra Hummus | Go Fork Go! Hummus is one of those dishes that it took me awhile to start liking. It seems like such a ubiquitously vegan food – I mean, there’s an entire chapter on hummus and its variations (I’m including white bean dips and spreads, etc) in ED&BV. When I first tried it, I didn’t “get it”. Why on earth would I want to dip my chip or cracker in a pool of mushy, cold paste? Yeah. A couple of years back, I finally tried hummus at a gathering and actually kind of liked it. Then I discovered that if I nuked my hummus in the microwave for a couple of secs to bring it to room temperature or a bit above, I didn’t mind it. Then I made my own hummus and fell in love. I’m kind of picky about hummus. There are some brands I like and some brands of some flavours I like. Oddly enough, my least favourite flavour of hummus is roasted red pepper. I like normal hummus and I like roasted red peppers. But the combination tastes absolutely terrible to me. Anyway, Sabra hummus is a brand I’ve heard tossed around on veggieboards and other forums and I’ve always wanted to try it. I checked out the website and it looked epic! It seems hard to find Sabra around here though. I swore for a long time I’d seen it somewhere (they’re kind of distinctive) but lately, when I’ve looked for it, I can’t find any of it. Anyway, the first time I tried Sabra classic hummus, it was in these snack packs. Sobeys and metro sells them… about half a cup of classic hummus and half a cup to a cup of pretzel crisps. They’re reasonably healthy, especially in these days of “these oil-laden chips are healthy because they’re baked and not friend!” or “sugar covered candy coated chocolate and caramel”. Anyway, I find the classic hummus good, but nothing to write home about. I like the pc brand hummus too. But if I want plain hummus, my favourite is my home made hummus. It’s pretty simple. Chickpeas, tahini, lemon juice, garlic, salt and pepper. But somehow it tastes different. I like my hummus marginally chunkier than pre-packaged tend to be and somehow even using canned chickpeas, my hummus still tastes better… imo, of course. Today I found the roasted pine nut hummus at metro… I’m working out of town and needed lunch. It’s fabulous. Amazing. Smooth, creamy and a little bit sweet from the pine nuts. Yum. I think this is my new favourite hummus. Pity it’s so darn expensive! Now I want to try the Hummus Abu-Goush (although I wonder if that will just be just like the roasted pine nuts one) and spinach and artichoke hummus (my favourite dip ever!). I think that’s it though. The rest look good but not great just from the descriptions. 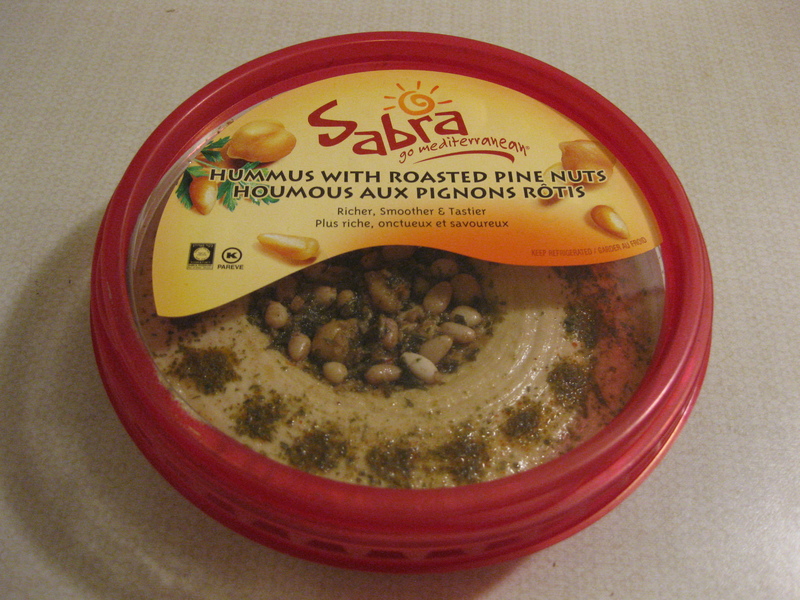 Now I just need to find a store near here that sells them… I can’t go driving off to London everytime I want sabra hummus! There’s a metro in cambridge… maybe I should try that. Although it’s probably a good thing I haven’t found it near here. I’d eat nothing but hummus if I did. Anyone have a favourite brand of hummus? Any varieties of Sabra hummus I must try? ← veganmofo 14: Pad Thai! We almost always make our own too. So much cheaper and tastier. But if you must buy out do try the garlic chumous with the mound of chopped roasted garlic in the center of the container. Our favorite. This is a message to the webmaster. Your website is missing out on at least 300 visitors per day. I have found a company which offers to dramatically increase your traffic to your site: http://voxseo.com/traffic/ They offer 1,000 free visitors during their free trial period and I managed to get over 30,000 visitors per month using their services, you could also get lot more targeted traffic than you have now. Hope this helps 🙂 Take care. site. Where else may just I get that kind of information written in such an ideal way?